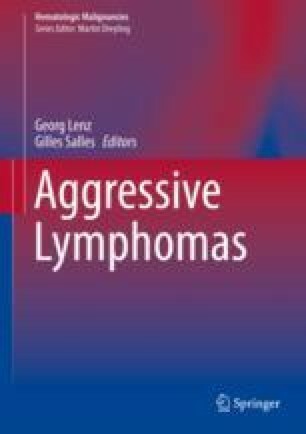 Peripheral T-cell lymphoma are rare neoplasms of the hemopoietic system with predominantly nodal presentation and aggressive behavior. Anthracycline-containing chemotherapy regimens represent the first-line treatment of choice, to be complemented with autologous transplantation in responding patients, if their clinical conditions are permissive, to consolidate remission, and to prolong survival. Nevertheless, many patients inadequately respond to chemotherapy or progress at the end of treatment. New molecules have been approved in the United States for relapsed and refractory disease, although response rates and, most of all, response durations are still rather poor when applied as single agents. Allogeneic transplantation may offer an opportunity of long-term disease control in patients with relapsed disease. This chapter reviews the current approach to peripheral T-cell lymphoma in terms of clinical evaluation, diagnosis, staging, and first-line treatment and presents possible treatment options for patients whose disease recurs after chemotherapy or appears refractory.